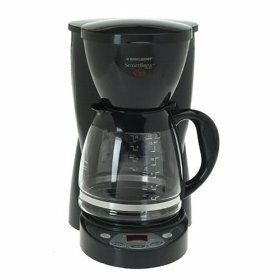 The Black and Decker DCM2500B cleverly brings simple solutions to consumers' various problems and expectations in a coffee maker, that make it one of the best in my book. First of all, this coffee machine is low-priced. Second, it has very intuitive controls, making it easy to program for even those with little to no experience with programmable coffee makers. Third, it has a cleverly built carafe, which is wide-lipped so it prevents spills. This coffee maker combines these features with others which is often seen with more expensive coffee makers, such as automatic shutoff and pause and serve. A low-priced, no mess, easy to use coffee machine that makes great coffee, and it's one of the best out there.